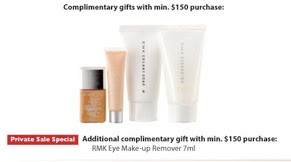 RMK launched their new Gel Emulsion Compact foundation at both the Isetan Scotts and Takashimaya counters today. It retails for S$73 and comes in 7 shades. The shade numbers starting with '1' are neutral toned while those starting with '2' are pink-toned. The shade range also includes a couple of medium and tan tones (#104 and #105), which is rare for a Japanese makeup brand. I swatched it briefly at the counter and found that it dries nicely to a smooth powder finish. At the current exchange rate, the price in Singapore is actually cheaper compared to Japan where it retails for 5775yen (S$90). Below is the GWP that Isetan will be offering during the Private Sale starting on Friday. Do you think it can cover blemishes well? According to the reviews on Cosme.net (the largest Japanese makeup review website), the foundation does provide good coverage of blemishes and pores. One review said that the coverage is superior to that of the RMK Liquid foundation and caused her pores to become virtually invisible. Most of the reviews for the Gel Emulsion Compact on Cosme.net are very positive with many users praising its natural finish, ease of application with the sponge and lasting power. I managed to get the new foundation! The case + refill costs $89. Refill alone costs $73. (Rather costly I feel). Indeed, I like its natural finish, ease of application with the sponge and lasting power. It even out skin-tones and provides reasonable coverage for dark eye-circles and redness. However, little coverage for blemishes such as acne scars. I also noticed my nose gets shiny after a couple of hours, but that can be solved with blotting paper. I will re-purchase it again. they have recently started a membership programme. Check stores for more info.